Our deck is looking good. We’ve got some bright painted furniture, a relaxing place to sit, all surrounded by lots of plants starting to flower. We have a little bird feeder hanging off the side that, when full, attracts all sorts of beautiful birds. Little Lady and I decided these birds might want a drink while they are visiting. So instead of buying or building a bird bird bath I convinced her a little one near the bird feeder would do. 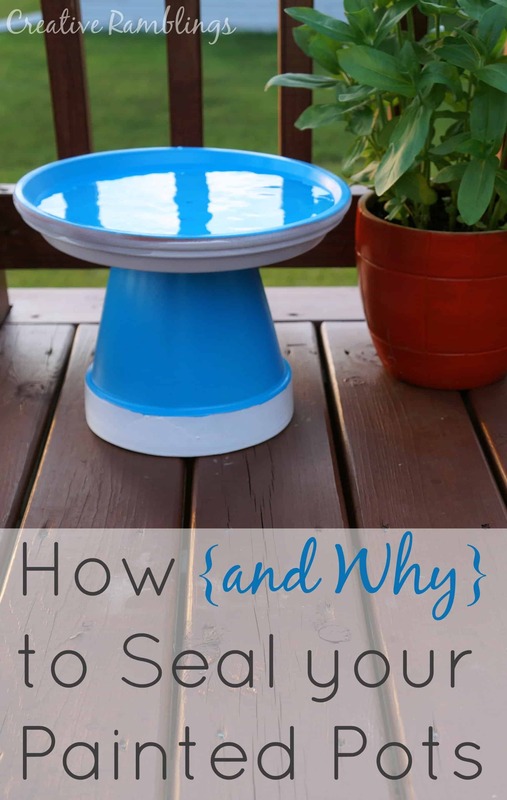 I’m sharing all the details on this little bird bath plus tips on how and why to seal painted pots. Be sure to watch the quick video below to see the full process. I purchased a medium terracotta pot and 16 inch saucer, just a couple of dollars each. 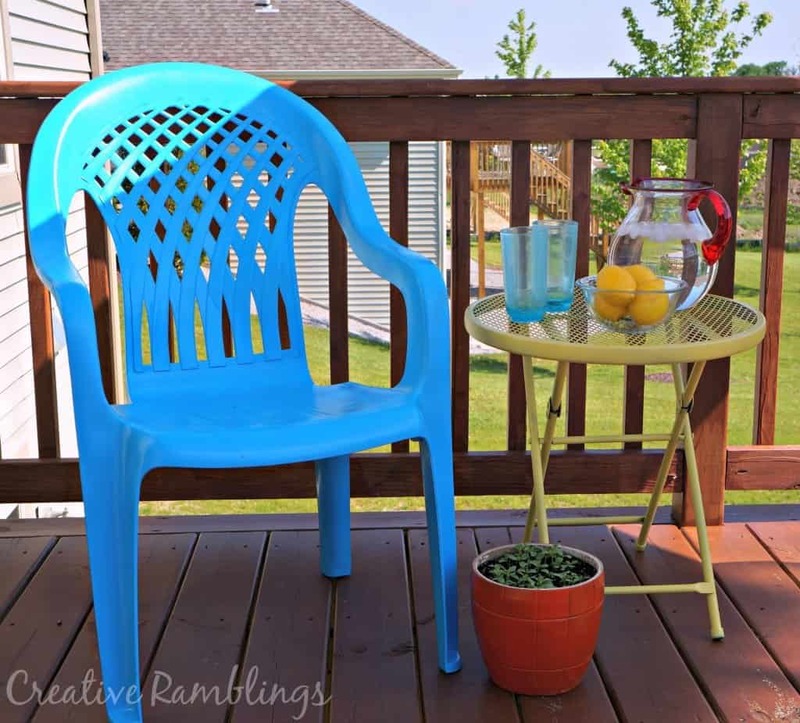 I used blue and white spray paint I had on hand from other deck painting projects. 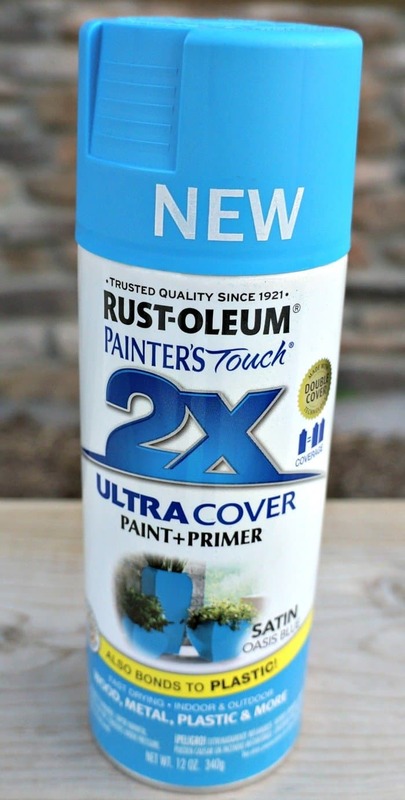 This is a great outdoor multipurpose paint. It’s what I used to paint my plastic chairs. It comes is a ton of colors, I highly recommend grabbing a few cans of this for your next outdorr project. 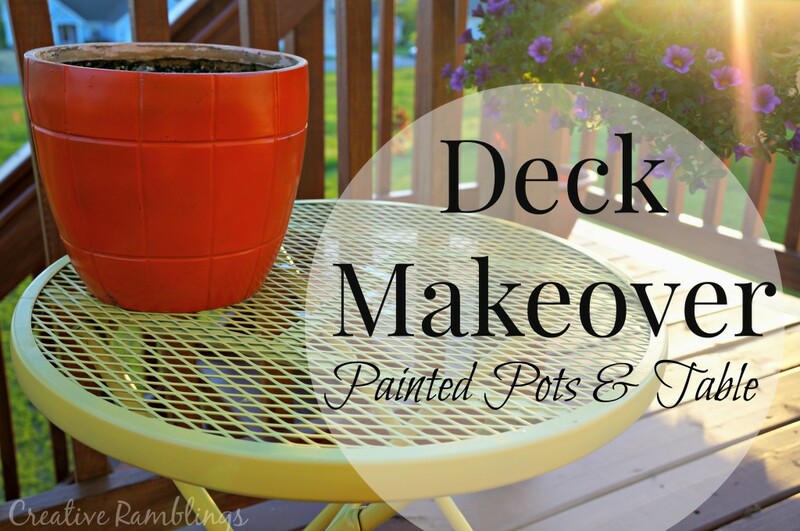 The key to keeping this looking shiny and new, and not breaking down over time, is to seal painted pots inside and out. This technique can be used on any pot you paint. So why seal painted pots? You spend time painting and making the outside beautiful. Then you add dirt, plants and/or water to the inside. Terracotta and clay pots are porous so the water seeps into the pot and needs a way out. It will eventually deteriorate your paint from the inside out. 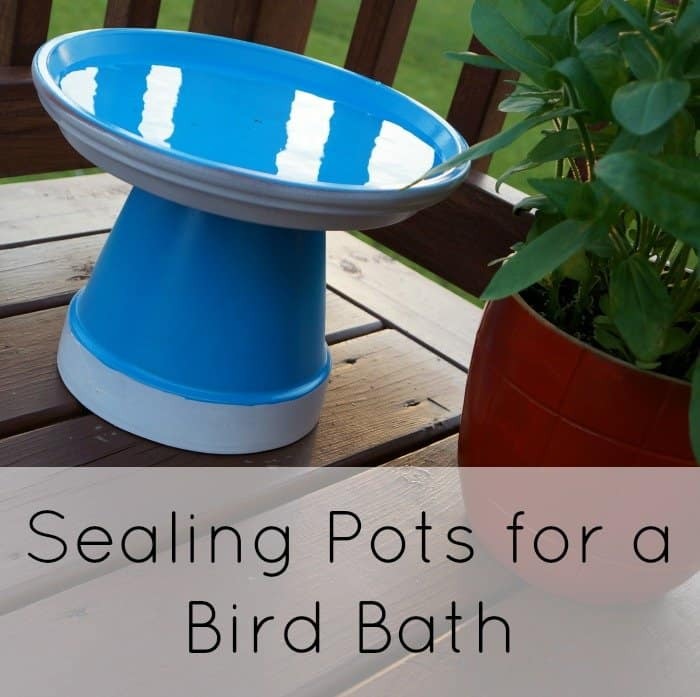 Before I painted my bird bath I used a clear sealer to spray the inside and outside of the pots. This is a thick high gloss sealer. I used it before and after the paint, and it adds a nice sheen to the piece. You can use just about any clear sealer for a project like this, just make sure it is suitable for outdoor use. This is my go to sealer and I have used it on all my outdoor pots. You can get a can right here and have it delivered this week! 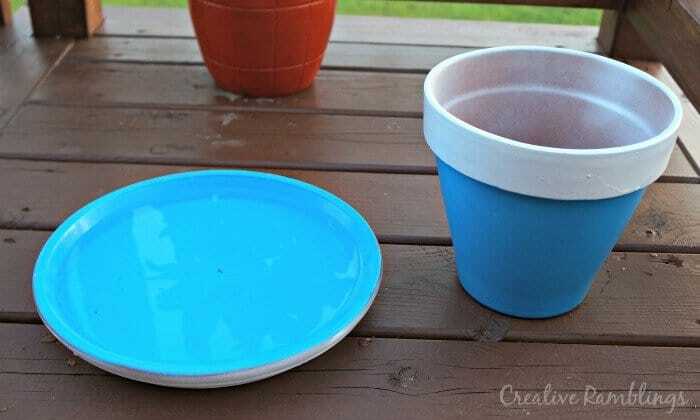 Be sure to pin this image above and save it for when you are ready to paint some flower pots. Do you have a bird bath? What kinds of birds do you attract? Great tip! Definitely a good idea to protect your pots! And what a creative and easy way to make a bird bath! Thank you. I never thought I would find a tut on how to turn my concrete water fountain that beautiful bright blue. My color scheme is Blue & Lime Green. Now I can do it! I am so thrilled. Thanks a million. Hope I can figure out how to follow u.
I wouldn’t have thought to seal the pot, so great info! I love how you made a bird feeder out of the pots. So cute! I never thought about sealing the pots but it makes sense. Thanks for the tip! P.S. I’ve totally done the same thing with my memory card. Doh! This is so cute! I’m gonna make one for my new apartment in a sort of brown-ish/tan-ish color. I’ll send you a link when I do! I’d love to see it Randell, this is the perfect size for an apartment. It will be so fun to watch little birds in your new birdbath! I’m looking forward to pictures! I know I am so excited, they are on the deck today but haven’t had one jump in yet. Great tip. The bird bath is really cute! 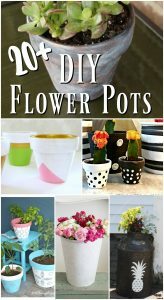 great tips, I have always wondered what to use to seal the pots. your pot looks lovely, I would like to know if you use glue to permanently glue them together or do you just rest one on top of the other? I am looking for a glues that would hold in the outside elements. Janice, thank you for your sweet comment. For this one I just placed one on top of the other. They are heavy, especially with water in the top so I haven’t had any issues with it falling over. Hope you find a glue that works! Do you if there’s any danger to the birds or other wildlife or insects from the chemicals in the glaze? Jane thanks for reading and for your question. I can’t give you a full answer because I am unsure. I no longer have this specific can of glaze. I imagine that there would be guidelines and more information on the glaze manufacturers website. Hope that helps a bit. Hi Jen, sorry for the delayed response. That sounds like a lovely idea. Once you are done painting the birds seal the pots (inside and out) with a clear sealer made for ceramic. Something like the product in this post. That will help the design stand up to the elements. I don’t understand the use of the Triple Thick Sealer. If you use it before you paint and it’s high gloss, doesn’t that keep your paint from sticking??? The purpose of the sealer is to keep the water from reaching the painted surface. The water from the pot will naturally seep through the terracotta and crack paint over time. I sealed these pots and let them fully dry then painted over the top. The paint stuck well and has held up great over the years. Great tip for sure. love your birdbath!!! Hey Sarah, what a fun project! And one can never have too many bird baths in my book. And thanks for the tip on that great spray paint…I surely will be using that soon. Hello I see this is an old post but have a question. Is the sealer non toxic? If birds and even bees drink from the water are we sure there are no toxic effects? Thanks! Hi Lisa. It’s a standard sealer for ceramic items, I am not sure if it’s non toxic. When working on the project definitely look into your options before sealing your pots. Thanks for visiting.